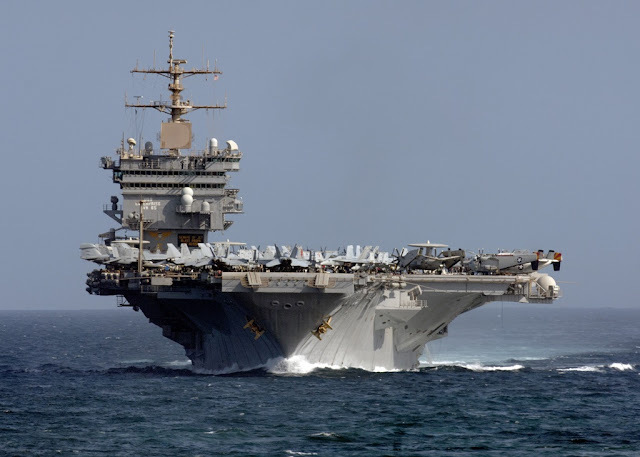 The ship is also known as "Big E", it was the world's first nuclear-powered aircraft carrier when commissioned in 1961. "For all that Enterprise represents to this nation, it's the people that bring this ship to life," said Beltz. "So as I stand in this ship that we all care so much about, I feel it's appropriate to underscore the contributions of the thousands of Sailors and individuals that kept this ship alive and made its reputation. We are 'The Big E.'"
Enterprise was the eighth naval vessel to carry the name. It was built by the Newport News Shipbuilding Co. and was christened Sep. 24, 1960, by Mrs. Bertha Irene Franke, wife of former Secretary of the Navy William B. Franke. The ship was put to sea in 1961 and safely steamed more than 1 million nautical miles on nuclear power over its entire career of more than 50 years. Key-note speaker Rear Adm. Bruce Lindsey, commander, Naval Air Force, Atlantic, used his own experiences aboard Enterprise to emphasize the unmatched adaptability and capability of not just this ship but of all nuclear-powered aircraft carriers. "One cannot influence world events if you are not on station and stay on station; in other words: to be where it matters, when it matters," said Lindsey. "Nuclear carriers are tough and no other country can match us in this respect." Though Enterprise's history is long and filled with numerous successful deployments, Beltz offered highlights from a letter written by Adm. James Holloway III, Enterprise's third commanding officer, which looked toward the future of the namesake in the proposed construction of the ninth Enterprise, CVN 80. "As this ship retires," Beltz recited, "we know the memory will live beyond her and we--the Sailors, the shipbuilders, the supporters of Enterprise--we are that link to the next Enterprise."